Unless radical measures are used to prevent it, Virginia and other parts of the Nation must surely in time go the way of all other countries in which people of two or more races have lived in close contact. With the exception of the Hebrew race, complete intermixture or amalgamation has been the inevitable result. To succeed, the intermarriage of the white race with mixed stock must be made impossible. But that is not sufficient, public sentiment must be so aroused that intermixture out of wedlock will cease. The public must be led to look with scorn and contempt upon the man who will degrade himself and do harm to society by such abhorrent deeds. W. A. Plecker, "The New Virginia Law To Preserve Racial Integrity," Virginia Health Bulletin,Volume XVI, Extra Number 2 (March 1924): 2. http://lva.omeka.net/items/show/62. The word “hapa” is the Hawaiian transliteration of the English word “half.” Much of its current usage derives from the phrase hapa haole, meaning “half white.” The phrase was originally coined by native Hawaiians to describe the mixed offspring resulting from encounters between islanders and White settlers. In subsequent years, hapa (or Hapa) has come into popular usage away from the islands, most frequently embraced by Asian/Pacific Islander Americans of mixed descent. 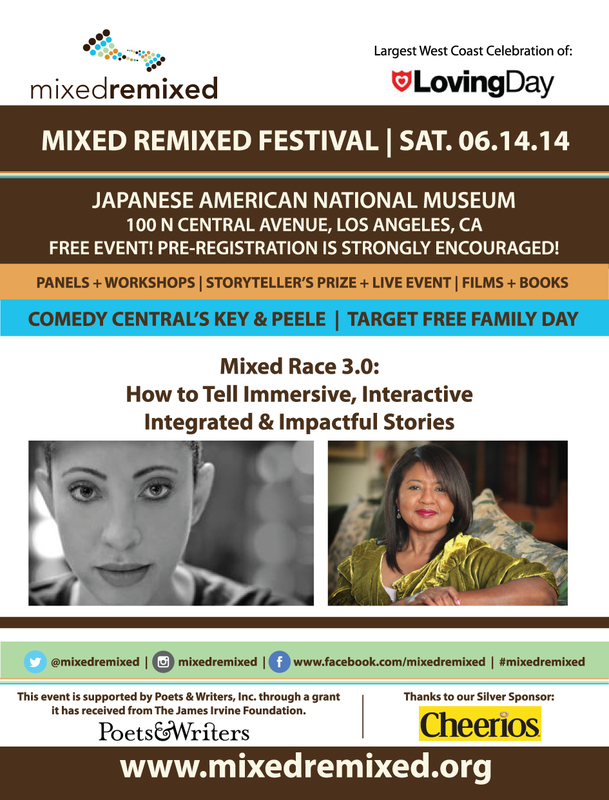 (Los Angeles, CA) The Mixed Remixed Festival will take place at the Japanese American National Museum in downtown Los Angeles (100 N. Central Avenue), June 14, 2014. …The event is free and open to the public; however, pre-registration is strongly encouraged. The complete Festival schedule can be found online at www.mixedremixed.org. Join us as we explore the experiences of Hapa Japanese Americans and their experiences in Japanese American basketball leagues. Hapa Hoops will feature a screening of JANM’s basketball documentary Crossover and will be followed by a conversation by Rex Walters, a veteran of both Japanese American basketball leagues and the NBA. DOWNTOWN LOS ANGELES – The very title of the new Japanese American National Museum exhibit indicates the complex factors at play in a single community. The show, Visible & Invisible: A Hapa Japanese American History, examines the diverse history of the Japanese American community as well as the still evolving notion of family and race. It opened April 7 and continues through Aug. 25 at the Little Tokyo museum. Through photos, videos, artifacts and paintings, the shows traces the history of mixed-race Japanese American families — hapa is a term for a person of mixed race who is part Asian or Pacific Islander — going back to the late 1800s. It also looks at the challenges these families faced due to segregation and laws that criminalized mixed race marriages. It’s a history, said Duncan Williams, the exhibit co-curator, that is often plainly visible in the faces of biracial individuals. However, he said the topic is also invisible, since it is rarely discussed in open forums. “One of the major points we’re trying to make is that increasingly the Japanese American community is changing,” said Williams, who is also director of the USC Center for Japanese Religion and Culture. Virgil Westdale’s exceptional life story might never have been published had he not attended a Halloween dance. Unsure of what to wear, the World War II veteran donned his Army uniform of the 442nd Regimental Combat Team, nearly sixty years after issue and still a perfect fit. On the dance floor, he met Stephanie Gerdes, who remarked, “it’s not really a costume, is it?” After many more questions spanning two years, the two collaborated on Westdale’s autobiography, Blue Skies and Thunder: Farm Boy, Pilot, Inventor, TSA Officer, and WWII Soldier of the 442nd Regimental Combat Team. Westdale has earned accolades in every occupation listed in the book’s lengthy subtitle through determination, talent and a strong work ethic. But his career path took an unforeseen turn because of his heritage. Westdale (born Nishimura) is half Japanese. Come join us at Hapa Japan 2013 from April 2-6, 2013 in Los Angeles for a concert featuring emerging hapa artists, a comedy night at East West Players, readings by award-winning authors, a historical exhibit at the Japanese American National Museum, film screenings of great documentaries, and a 2-day academic conference at the University of Southern California. The 3rd Annual Mixed Roots Film & Literary Festival will take place at the Japanese American National Museum, 369 East 1st Street, June 12-13, 2010, in downtown Los Angeles. In the Obama age, this free public event celebrates storytelling of the Mixed racial and cultural experience including that of transracial/cultural adoption and interracial/cultural relationships. The Festival, a fiscally sponsored project of the New York Foundation for the Arts, a non-profit organization, brings together film and book lovers, innovative and emerging artists, and multiracial families and individuals for two days of workshops, readings, film screenings and live performance including music, comedy and spoken word. Today, 7 percent of all marriages are interracial, according to the Census. More than 6.8 million individuals identify as Mixed. DOWNTOWN LOS ANGELES – Upon entering Mixed, the recently opened show at the Japanese American National Museum, one can’t help but smile. The happy young faces depicted in the 70 photographs that make up the exhibit are filled with joyful innocence. One image shows two girls, one in a ballerina outfit, the other wearing rainbow stockings and a necklace and bracelet to match, engaged in a carefree dance; another portrays a little girl proudly holding up her two colorfully dressed rag dolls; a third depicts a close-up of a smiling boy, his long dreadlocks flowing down his face.